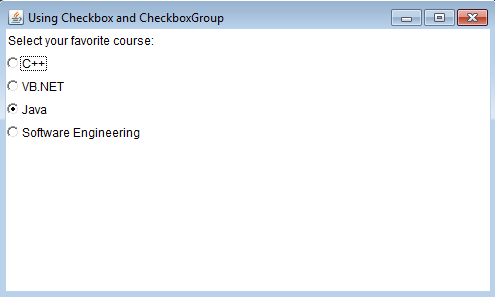 With Checkbox class you are able to create a list of items that their states can be turned on or off. You can turn on or turn off multiple items. 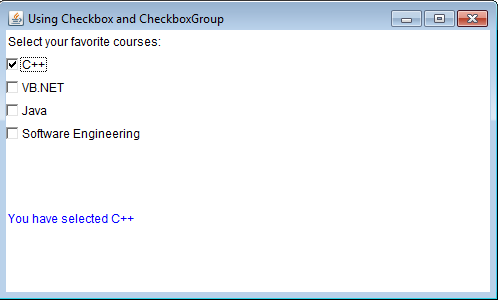 However, if you want to allow a single item to be turned on or off, you must place the checkboxes in CheckboxGroup. The Checkbox can generate item event. To receive the item event, the application must implement ItemListener interface and uses the addItemListener(ItemListener listener) method. The ItemListener interface has itemStateChanged(ItemEvent e) that needs to be overridden to perform action when the user selects or deselect the items. creates a check box without label. creates a check box with label. creates a check box with label and allowing state input to turn on or turn off the check box. creates a check box with label and allowing state input to turn on or turn off the check box and specifying check box group. reads the label from the check box. reads the state of the check box. sets the label to the check box. sets the state to the check box.